chocolate chip pancakes for dinner?! fridays in Lent can make it so hard on dinner! NOW she cares about her hair! the child who would rather shave her head bald? again. sigh. they do grow up, right? right? 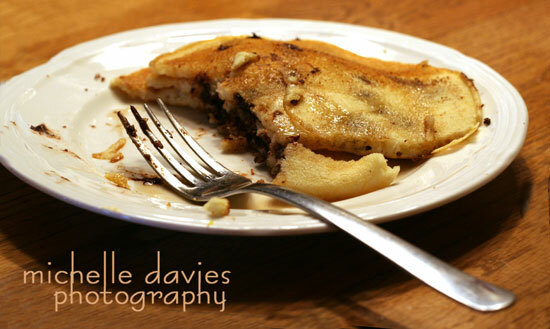 >Chocolate chip pancakes sound so good to me! Nice that your dd would make them. I like the angle on the first shot. Thanks for sharing. >Pancakes for dinner, quick and easy, we do this too. Have never made them choc chips, dinner and desert on one plate! Love the milk in the stemware, very classy! >Chip pancakes have never been a fav of mine, But all my friends like them. I guess I’m just strange. Cute pic….seems just a bit dark to me, though. 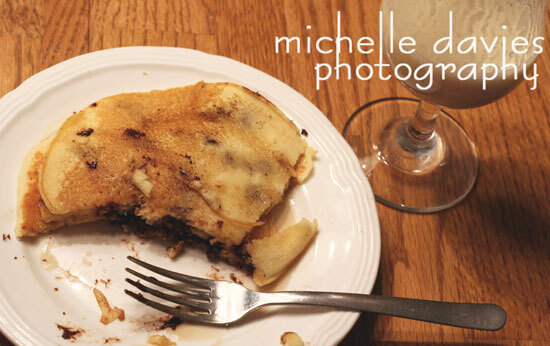 >Chocolate chip pancakes…yummy! I really like the 2nd photo – the half eaten pancakes, the fork, and the milk glass in the corner really bring it all together.Oh – and I LOVE your frappacino bottles from the previous post. I don’t know how I missed that one but I love the idea!! >Lent or not, breakfast for dinner is one of my favorite things. CC pancakes sound yummy. DH loves cinnamon pancakes. They both sound delish right now.